So a few weeks ago we had a little work outing to the Pittsburgh Zoo. Now, since I’ve been a kid, I think I have made it to the Zoo twice…and I’m talking twice in 15 years. I guess the zoo isn’t a place that you need to regularly, but it’s still fun whenever you do make it! We were lucky…most of the animals were out and about! Hope you enjoy! This was one of the first shots that I took of the day, ran it through a bit of HDR processing, and this is the result! I loved how you can see him drinking. It took him about 2 minutes to back into the pool of water, but once he got there, he definitely looked pretty comfortable! I guess not every animal at the zoo is too keen on having their picture taken. This gorilla was just laying there, and when I walked up, he seemed to spread his fingers so he could see me, then recovered his face and told me what he really thought of me! No trip to the zoo is complete without a picture of the king! He looked very content sitting up there. Not sure if it was because he was relaxed because it was a beautiful day, or because he was thinking about how delicious we all would taste! This was probably the coolest sights of the day! 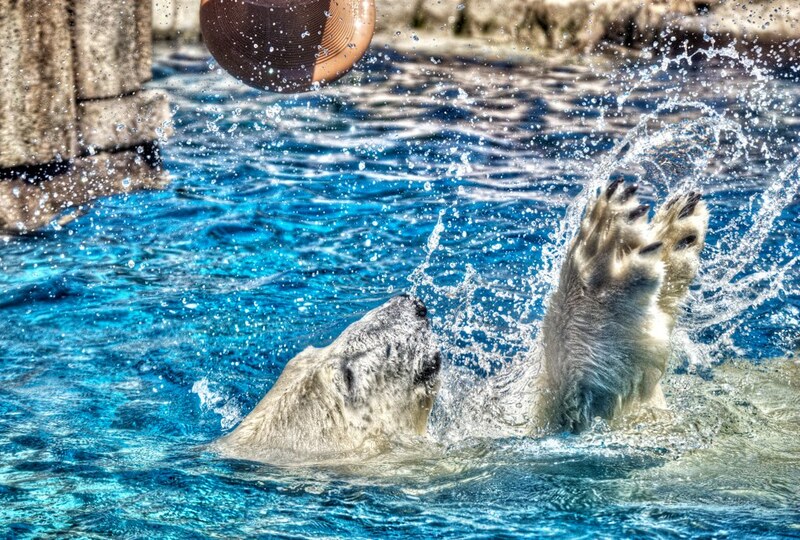 This polar bear kept doing belly flops into the water and playing with this spool like toy! He would throw it up in the air and try to catch it! Another shot is below. This mandarin was sitting really close to glass, watching the people as much as they were watching him. The sign right next to him detailed how the brighter the colors on the mandarin, the more anxious. angry or exited they are. He must have a lot of anger that is just boiling up inside!!! These two antelopes were fighting each other over the affection of the a certain female who didn’t even appear to be interested in what was going on! It was like she was saying “Whoever wins, that is the only way I will aknowledge you!” As an FYI, the one on the left won! Our last stop of the day was the shark tank. At first I didn’t think I was going to get any shots at all, because there were no sharks to be seen! All of a sudden, a shadow started moving towards me, and this guy gave me a perfect profile shot! I know it’s a bit grainy, but the d40x is just ok in low light; the 35mm f1.8 lens helped, but the d700 I get in a few months will help even more! Hope you enjoyed my trip through the zoo! !